Author: Conway, David Set In . . .
A reassuring story about the arrival of a new sibling. Ama wants to honor her newborn baby brother with a special gift, as is the custom of the people in her village. When Grandma Sisi suggests “the gift of love,” Ama sets off in search of this important present, but how will she know when she has found it? 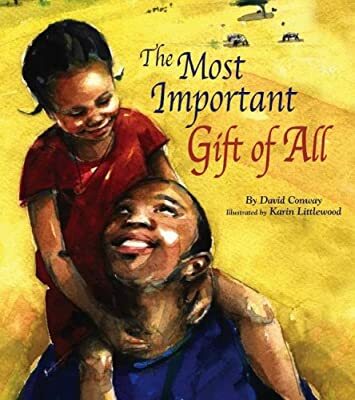 This richly illustrated story, told in the folktale tradition, celebrates a young girl’s simple, earnest discovery of the most important gift of all. David Conway is an established poet and a fresh, new voice in children’s picture books whose keen interest in world travel and culture has influenced his writing. He drew inspiration for The Most Important Gift of All from his love of reading folktales from around the world. Karin Littlewood’s travels to Kenya are reflected in the warm, vibrant colors and lush, richly detailed landscapes of her illustrations. She is frequently invited to speak at elementary schools, where she enjoys sharing her passion for picture book illustration with young children.